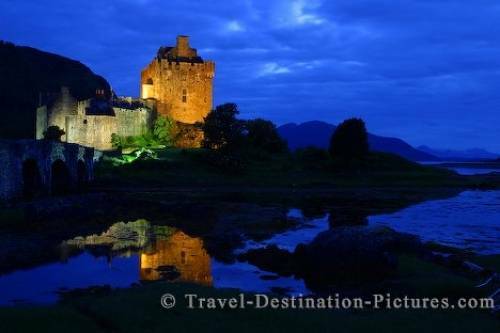 Eilean Donan Castle on the shores of Loch Duich in north western Scotland was not only the setup for the famous movie "Highlander" featuring Christopher Lambert and Sean Connery, it is also one of the most beautiful castles in Scotland. Set on an island connected by a bridge it provides very pretty sceneries during sunset and blue hour. Picture of Eilean Donan Castle in the north west of Scotland, Europe.